Donald X. Vaccarino, the designer, was aiming for a newer style of game that had tons of replayability. Having virtually created the genre, Dominion earned Donald X. Vaccarino the most prestigious board game design award: The Spiel des Jahres. 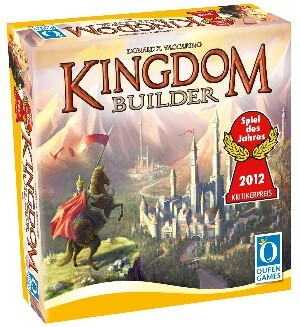 Kingdom Builder, his latest offering, received another Spiel des Jahres showing us that Vaccarino is here to stay. The first thing you'll want to do after setting up the game is develop a game plan. Without a plan, your choices in the game will lack the cohesion necessary to do well. This is true of many strategy board games. In Kingdom Builder, it is especially important because a poorly planned first few turns can drastically limit your future options. A good plan takes the overall map layout into account. You'll want to take a good look at where the rivers and mountains are on the board. These create natural divisions that only a few of the special tiles can get you past. 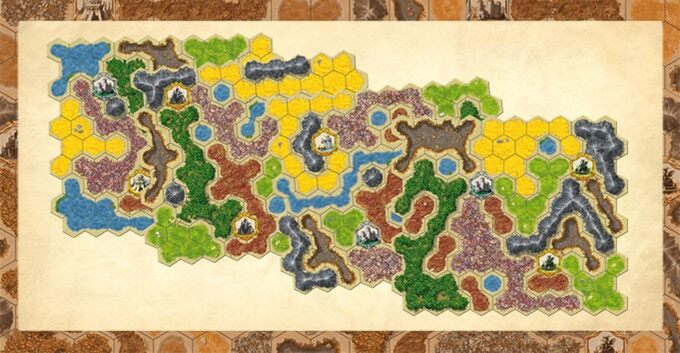 You don't want to plan to span the whole board and halfway through realize there is a huge river in your way.This map is very divided. A river on the right divides the map in two. The rivers and mountains on the left side leave just a small gap. Additionally, a good plan keeps the goal cards in mind. Some of the goal cards score a small amount of points per game (Fishermen, Miners, etc)., while some of them can yield a lot more (Farmers, Lords, etc).. An easy way to identify the high scoring cards is to do the math on what its maximum potential is. Optimizing the larger scoring cards while still scoring a few points of the smaller point getters will net you a better score at the end! Generally, you will want to have settlements in a few different areas of the board. This leaves you the best opportunities to score off multiple goals (The Farmers, Lords, and Hermit goal cards in particular make this appealing). To make this happen, you have to plan to keep your options open. Normally, when you look at your terrain card, you only have one or two options where to place your settlements. If none of those options help you score or interfere with the plans of others, your turn is mostly wasted. The fewer options you have, the fewer chances you have to score. For this reason, you really want settlements in two or three areas of the board. If you place you first three settlements next to each of the terrain types, you will have to place all your future settlements adjacent to it. We just mentioned why that's bad, so what should you do instead? You place your first three settlements so they touch as few other terrain types as possible! If you can manage to touch no other terrain types, then your next three mandatory settlements will be an opportunity to start a second area of settlements! (Barring, of course, that you draw the same terrain type twice in a row). Be careful what you touch! Any time you build adjacent to a terrain type, you are forcing yourself to build in that area anytime you draw that terrain card. You certainly can't avoid touching new terrain areas for the whole game. However, you can plan to leave yourself at least two options for each terrain card that comes up. The special tiles are fairly easy to get and are another way to diversify your options. Because of this, they are a much sought after commodity. And since there are only a few of each of the tiles, your first few settlement placements should be aimed at getting you a couple of these. Special tiles often let you play extra settlements. Being able to play two more settlements per turn than everyone else is a very solid way to score a lot more points. Additionally, the person who can play the most settlements per turn can control when the game ends. If you've laid out 50% more settlements than anyone else, you will probably win. Other special tiles let you bend the rules. Normally, you are limited by your terrain card, but a special tile like the Oasis will let you build one settlement on a desert tile any time you need. The map divisions mentioned in the planning section become less important if you have access to a Paddock or Harbor to cross natural boundaries. All in all, the special tiles feel a bit like cheating. And when that's legal in a game, you should do it!